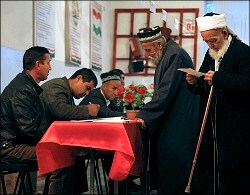 Over 80 percent of eligible voters participated in the latest presidential elections in Tajikistan on 6 November 2013. According to the central elections committee (CEE) of Tajikistan, 83.6 percent of those voters cast their votes in favor of the current president in office, Emomali Rakhmon. But there is a flaw in these figures, and it does not take long to figure it out. So, the CEE reports that there are 4.2 million eligible voters in the country, of whom about 260,000 were in Russia on the Election Day. Howsoever, the latest statistic data the Federal Migration Service of Russia released recently shows that over 1 million (!) Tajik citizens aged 18 years and over were in Russia as of October 2013. Obviously, 99 percent of these citizens did not vote; besides, November 6 was a workday in Russia. Henceforth, the percentage of voters in Tajikistan had to have been 110%! Clearly, the election outcome was grossly falsified. But the outcome was already known anyway. Yet another “victory” President Rakhmon embraces was simply inevitable primarily thanks to the increasing number of those labor migrants. The president of Tajikistan will remain in office for another seven years, having ruled for 21 years already. Tajik citizens do not wish to leave their homeland, obviously. But such factors as unemployment, crisis in economy, corruption, nepotism and authorities’ arbitrariness are forcing people seek jobs and happy lives abroad. Well, just like in Russia, where these very Tajiks come to, but at much larger scales. To be sure, the ejection of these most active bulges of population has been serving as a direct panacea for Tajikistan from social disturbances and crises. Because only those who want changes, those physically fit and smart enough to earn are leaving the country. In other words, a mass capable of waging revolutions, or at least “shake” the powers that be are leaving the country. No, they leave Tajikistan, shun politics, stay away from Tajik polling stations in Moscow or Sankt Peterburg; instead, they break their backs at work and remit some 3 billion USD to Tajikistan annually. Indeed, those Tajik subjects who disappeared from sight in Tajikistan and have been sending significant monies would make any ruler happy! He—that very ruler—can happily and peacefully continue ruling over remaining subjects until another financial crisis rocks the world or those Tajik migrants are put on railway cars en mass and deported homebound. With this in the backdrop, the Kremlin seems to have made a very practical decision by introducing favorable conditions for Tajik migrants in response to Dushanbe’s nod to extend the Russian military base’s lease. As of January 2014, the labor migrants from Tajikistan will be able to obtain work permits for three years. This could perhaps be interpreted as the Kremlin’s guarantee to Rakhmon that no social unrest would disturb him until the next presidential elections. But then again, if he starts “behaving badly” and will think of driving our military base out, then we will drive “his” Tajiks out of Russia. We would not want that, because Tajiks are very cheap and lowbrow workers—and we need them.